Behrens has mapped a complex geography of contemporary North America, with settings that shift continuously , casually, between east and west, north and south: from Montreal walk-ups to Manhattan brownstones, from B.C. ferries to California bedrooms. It is a geography of dislocation that finds it natural expression in Behrens' stripped-down prose and spare story lines, and in the atmosphere of threat that vibrates quietly under the narrative's deceptively simple surface. "Many young writers have an epic hunger for place and experience. Very few have the miniaturist's tact for making the blunt enormous world entirely theirs. Peter Behrens is such a writer. His 'night drivers' are the grandsons of Kerouac's Dean and Sal, on the road from everywhere to nowehere, but without their hope and innocence. Night Driving is a wise and accomplished book of stories." 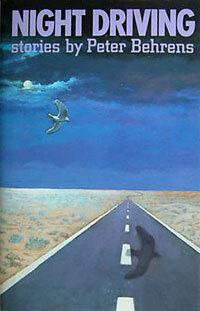 Night Driving, Behrens’ first book, demonstrates the polymorphic beauty of the short story form. Quiet stories reminiscent of Dubliners, bump against violent disjointed shards and travel pieces. Plot is not paramount but under the surface is menace, movement, a skewed perception. There is an influence of Jayne Anne Phillips, of Cheever, also of Europeans like Isaac Babel and Joyce, interesting influences to sort, to splice. In these nineteen stories Behrens turns the usual coming of age trek on its head: the central character or narrator is younger and younger with each story, until on the last page, a small boy in a canoe watches his father, a fighter pilot, scream above all in a jet like some tin god, an evocative final image for an exciting collection. Behrens has published in Atlantic Monthly, Saturday Night, Best Canadian Stories and on CBC. His is fiction as I like it: cranked up, fragmentary, full of brooding animal implications, electric with lightning storm energy burnt on desert highway, in Kerouac’s cars, in cities of strangers. Behrens, from Montreal, now living in Santa Barbara, deserves some of the attention lavished this decade on writers like Ray Carver, Richard Ford, and Sam Shepard. Night Driving is out of print, but available at abebooks.com and Amazon.